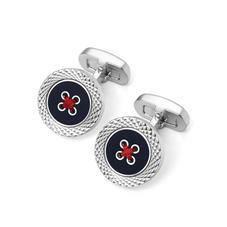 A particularly charming offering from our cufflink collection, our Silver Button Cufflinks are crafted to infuse your repertoire with a dose of panache. The sterling silver t-bar and plate setting is elevated by a button design, complete with centre cross stitch; a reflection of our craftsmen's dedication to detail and quality. A choice of red and navy blue allows you to indulge your personal style; a perfect companion to a formal look when paired with a leather belt. Such a refined accessory deserves a fitting home, provided by our premium leather cufflink boxes. 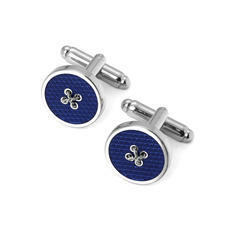 Our Sterling Silver Plated Button Cufflinks are the perfect accessory choice for the discerning gent. Handmade in Sterling Silver Plate with an enamel centre and a t-bar fitting, the exquisite attention to detail is the epitome of understated luxury. Each pair of Sterling Silver Plated Button Cufflinks arrives in an exquisite Aspinal signature jewellery presentation box.